1,763 Artworks have been viewed 1,763 times. 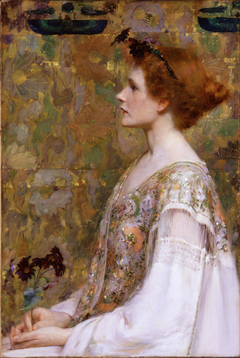 Albert Herter (March 2, 1871 – February 15, 1950) was an American painter, illustrator, muralist, and interior designer. He was born in New York City, studied at the Art Students League with James Carroll Beckwith, then in Paris with Jean-Paul Laurens and Fernand Cormon. He came from an artistic family; his father, Christian Herter (1839–1883), had co-founded Herter Brothers, a prominent New York interior design and furnishings firm. Herter Brothers closed its doors in 1906, and Albert founded Herter Looms in 1909, a tapestry and textile design-and-manufacturing firm that was, in a sense, successor to his father's firm.